I like the horses I care for to have hay in front of them 24/7 in order to prevent ulcers. Having treated ulcers before, I can honestly say that preventing them is much less expensive than attempting to cure or manage them. Even if it means buying a Porta-Grazer. Which is what I did (actually I bought two) when I went to the Equine Affaire last fall. Ulcer prevention wasn’t my only reason. What actually prompted the expenditure was a new horse, who likes to take huge bites of hay, the bigger the better, dunk them and eat them. I’ve never seen a horse go through a flake as quickly as this one. I can throw a flake into his stall, walk down to the end of the aisle, and by the time I return, it will be gone. The only thing I’ve seen like it is my Yankee-Irish horse whispering boyfriend with half-a-dozen donuts from Mrs. Murphy’s. They don’t have slow feeders for donuts, which I could definitely use, but they do have slow feeders for hay. When a slow feeder looked like the best alternative to two bales a day or an empty stomach all night, I immersed myself in the virtual world of slow feeders. In the process, I visited a lot of websites that reminded me just how unnatural natural horsemanship can be. After looking at the alternatives, the Nibble Net looked like the best of the bunch (I have a client who loves hers). I thought I could save on shipping by buying my Nibble Net at the Equine Affaire and carrying it home with me. …but I listened for a bit, until I decided I had to interrupt and ask questions (I had to go see Tina and Jimmy and Anne). The product looked good. My concerns were: how much hay could it hold, would the horses tip it over, what was wrong with it and how much did it cost? The answers I got were: It can hold 30 pounds of hay, the horses don’t tip it over, there’s nothing wrong with it, and it would cost $229 if I bought it without the lid/water bucket and $279 if I bought the whole shebang. Shipping was free if I bought it during the show. Which, if you’ve been reading closely, you know I did (and you know I bought two). I justified it by telling myself that the Porta-Grazers would pay for themselves with the money I’d save by not throwing out wasted hay. I thought there was a good chance that it was going to tip over and we’d see about the problems that caused, we’d see how much hay it would hold and what else was wrong with it that I didn’t know. We’d see if the horses would think it was a monster or whether they’d go on strike for a while rather than eat out of it. I followed the directions that came with it, which told me how to fill it and told me to present it alongside the hay the horse is used to seeing. I stuck the flakes in, opened up the stall door and slowly dragged the big green pail into my voracious horse’s stall. He shot it a glance and went back to grabbing huge bites of hay in his mouth. I placed the pail alongside the hay that was on the floor of his stall. He stuck his head into the pail and pulled out a few strands of hay, with the same mouth-motion he would make if he were eating grass. Then he knocked it over. Then he rolled it around his stall. Then he knocked it into the walls. And then he tipped it up and began eating out of it again. Okay! Throughout the afternoon, he alternated between hay on the floor and hay in the Porta-Grazer. That horse has an easygoing temperament and isn’t spooked by anything, so I wasn’t that surprised by how easily he took to the Porta-Grazer. My retired TB is another story. He is sensitive with a capital S. Not spooky but likes his routine and likes it even more now that he’s retired and can count on it. He’s still protective of his food after all these years and will pin his ears when my Yankee-Irish horse whispering boyfriend throws hay. My boyfriend doesn’t understand why my horse hasn’t yet made the connection that my boyfriend is the one bringing the hay not taking it away. I decided it was the safest solution to introduce the Porta-Grazer in the paddock rather than in the stall. So I dragged it (I still can’t lift a whole lot since I broke my back) and placed it, empty, in the center of the paddock. He walked right up to it and stuck his head in. Then he tried to lift it up with his teeth. Then he knocked it over and rolled it around. Then he stood it back up. I filled it with hay and put the lid with holes in place. He started eating hay out of it and wouldn’t leave it to go back to his hay on the ground. His paddock mate, who sees monsters with great regularity, stood nearby, with his neck outstretched in the direction of the Porta-Grazer. I felt terrible that I hadn’t gotten him one of his own. And now I will. You can find out more about the Porta-Grazer here (I should also tell you that it has a drain plug, so you can use it to soak hay and then just drain it and feed it). It’s interesting that the promotional video now shows the horses knocking over the pails and rolling them around…no matter. I’m a fan. Just don’t count on filling it with 30 pounds of hay. But count on feeding two flakes at a time in the way horses like best. Or try out the new XL size. It will only set you back by an extra thirty bucks. After all, you’re not keeping a running tally on your horse expenditures, are you? If you are, go here, where I present the alternative. I like the idea that you can feed pellets (although I don’t) or hay, and it seems well constructed and strong, but for $100 per bag as opposed to $279 ……I am keeping my Nibble Net. I think the Nibble Net is a great alternative. How are yours holding up? Since I hang mine and almost never put them on the ground, they have held up like new! I like the idea, but at this time- without my own place, I’m not willing to pay that much for a slow feeder. Last winter I got small mesh hay nets and put those out in the pasture. Those worked until the horses rolled them out of the pasture. This year we’ve got two of those metal feeders out in the pasture (ugh, but they do keep the hay off the ground) and I hang four bags in the run-in and that seems to work pretty well. I’m still considering what I want to do when we get our own place. I’ve noticed that the mares are more likely to choose to eat out of the nets than the boys. Not quite sure what that’s about. BTW- I’m going to Equine Affaire in Ohio this April. And- not quite related- I think “As the Pitchfork Turns” should be made into a real soap opera. Intrigue, love triangles, cat fights, and horses! What’s not to like? I have no place to hang nets, aside from the stalls, since I have Horseguard fencing and I don’t want to hang anything from the trees, so the Porta-Grazers really work for me. They are expensive. But I still think they’re going to pay for themselves over time. I agree that a soap opera based on horses would be popular. Or better yet, a reality TV show. How about “The Real Horsewives?” There’s never a shortage of horses, women, competition and barn drama! Does that grate inside ever fall out? No. Not even when they toss the whole thing around. It’s pretty ingenious. It’s easy for us to take out and put in, but it fits inside a small lip around the lip of the pail, and the horses can’t remove it. It seems like such a simple design I would think you would be able to duplicate it using those big old supplement pails (or bigger plastic ones) that you collect over time.You could take one pail cut it in half, then take another pail and cut the round openings in that one. Then fit the 3 pieces together. Gotta be cheaper than $279. It would be hard to duplicate this feeder. The plastic is very thick and all the edges are rounded. The fit of the insert with the holes is the “magic” part — because it’s easy to take out and put in, but it fits “just so” under the very small, rounded lip of the pail, which makes it impossible for the horses to remove it or for it to fall out when they play with it. Alas, I just bought 2 Porta-Grazers and have to report that I’m not extremely happy with them. I was using a slow feed hay net which was working out pretty well with the exception of being time consuming to fill and close. The Porta- Grazer doesn’t seem to restrict as much as the hay nets. One major downside is being woken up in the middle of the night because the darned thing is empty and the horses are kicking at them to try to get every last drop of hay. Sounded like a very loud drums from 1 AM until I removed the darned things this morning. My husband was not happy. Anyone have any suggesitons on a solution for this? I have not used the porta-grazer myself as of yet, but do hope to get one soon. During my research, I saw that the pans come in different sized holes, all the way from 3″, 3.5″ and 4″. For other people who haven’t bought theirs yet maybe the 3″ option is the way to go. It is the size that is necessary if you have ponies. Hi Shannon — I’m sorry that these aren’t working out for you. I really appreciate you contributing your experience here, because I didn’t know that the slow feed hay nets restrict hay substantially more than the Porta-Grazer does. Or perhaps figure out some way to block some of the holes in the Porta-Grazer or to make them smaller? When you fill your hay nets, do you fluff the flakes inside them? What if you stuck a couple of flakes in your hay nets, knotted the nets and stuck them inside the Porta-Grazer? I don’t know if that would be any less work than hanging your hay nets. FWIW, my horses all enjoy playing with their Porta-Grazers…I guess I’m lucky they’re far enough away from me that I don’t hear them. Have you tried contacting the company to see if they might have a solution for you? Maybe some of my other readers have suggestions or have solved the problem in some way. If you come up with something, I hope you come back and share it with us. Feed them later in the evening and more often so they dont run out of feed in the middle of the night. Hi Amy — Thanks for adding to the discussion. I completely agree that feeding later and more often is the healthy solution for most horses, but not for those horses who take in too many calories to keep them in a good body condition when given free-choice hay. Insulin-resistant horses, especially, have this problem. That’s why there are so many slow feeders and why they’re so popular. I have 8 portagrazers at my place. Love them. I can tell you’re committed, Sandy! My Porta-Grazers are still in perfect condition, after daily use for for four years. Katie, are your horses willing to put completely their head inside the Porta-Grazer when the hay is finishing ? Hi Ann — Yes, they are. They clean it up, everything they can reach. They really love these things. Both of mine are still going strong. My Porta-grazer arrived today. My gelding always tests everything to the limit. One of the first things he did was put his foot inside it. It has a lip around the top that allowed the back of his shoe to catch on it when he pulled his foot out. Big wreck. Poor design. Surely I am do not have the only horse wearing shoes who will put his foot inside the feeder. Hi Sara — I’m so glad you shared your experience here. That is terrible. I’m so sorry to hear about what happened to your horse and I hope there were no injuries. This is the first I’ve heard about any accidents with the Porta-Grazer. Hi Kathleen – It sounds as if your horses are having trouble getting to the hay. Is that right? I’m not sure what you mean by “getting it to spin.” I can only imagine that your horses are spinning the inside in an attempt to get hay. Do you fluff your flakes before putting them in? Load them edgewise? I always put my flakes in as is, without fluffing, alternating them, so the long sides went one direction and then the opposite. You need to make sure that there’s not a hump when you load your hay. You also have to be careful not to overfill them. If you do, sometimes part of a flake gets stuck, propping up the inside piece, while your horses attempt to get the hay that they can’t reach. Maybe you’re already following all these suggestions, in which case I don’t have any suggestions, except maybe that this method of feeding isn’t ideal for your horses. I would be concerned about my horses eating plastic, too. Hi! 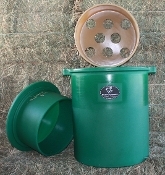 Great review, I have been searching for a slow feeder for a long time….Cushing’s horse on a strict diet…very small amount of soaked hay (2 a.m./ 3 p.m.) which is gobbled up very quickly! These seem to be the best option but incredibly expensive. I don’t want to get the wrong one! What size did you purchase that fit just the 2 flakes? It was suggested I get the XL or corner model with 4″ holes since the hay will be soaked, I’m just afraid it will a)be too much dead space in the bucket or b)will be too large for a 10×11 stall. What do you think, in your experience? Hi Kerry — When I purchased my Porta Grazers back in 2012 — and they’re still going strong! — the company produced different models with different names. I discovered this when I went to the site to try to answer your question. I’m assuming this is true of the new models as well, but you don’t have to worry about “dead space” because when the lid with the holes is in, it “follows” the hay down to the very bottom of the tub. If you wanted to, you could put a single flake in at a time, and it would still work perfectly. I would recommend that you get the smallest holes possible. I’m not sure about the condition of your horse’s teeth, as perhaps your horse is elderly, but some horses can really grab hold of hay through the holes and pull out a surprising amount! One of my horses was much better at this than the others! Best of luck, and please come back and let us know how it works for you!